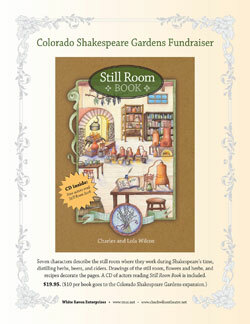 Garden Members/Volunteers to help with the Colorado Shakespeare Gardens expansion work during the spring and summer. Tour Guides to help educate people about the plants in the Shakespeare plays. Answer questions when you know the answers. Patrons of the Colorado Shakespeare Festival stop by to see, feel, smell, and sometimes taste the plants. Knowledge of some plants is recommended. Prepare Synopsis of the next year's plays. Research Plants in the next season's plays. Explain the plant quote. Find tidbits about the plants' mythical, magical,and medicinal values.